An Israeli navy ship fired, on Thursday evening, live rounds at a Palestinian fishing boat in the Sudaniyya Sea area, west of Gaza city, causing serious damage to the boat, in addition to spraying the fishermen and their boat with water cannons. 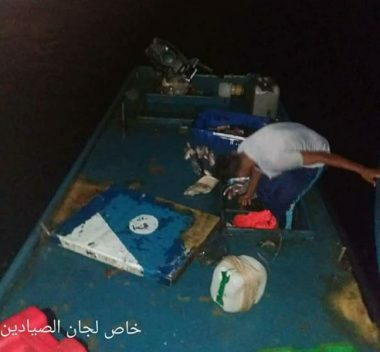 The fishermen said the navy attacked them with live fire, forcing them to sail several nautical miles towards the southern part of the Gaza Strip in an attempt to avoid further assaults, but the navy chased them. The navy then stopped the fishermen and ordered them to stand at the edge of the boat before spraying them with water cannons, pushing one of them, identified as Misbah Nafeth Salah, off the boat for an approximate distance of twelve meters. The fisherman then swam toward the boat, while the navy sprayed it with more condensed water, damaging its engine and GPS system. The navy then left the area, and the fishermen started trying to salvage their boat, and managed to get back to the shore.